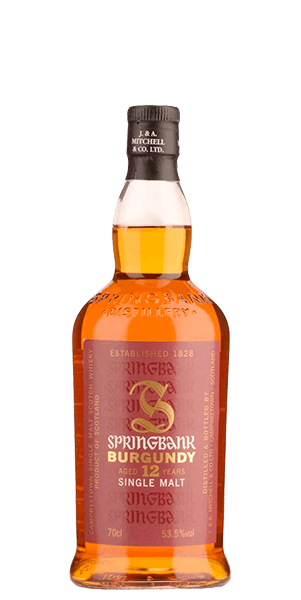 A bold, lightly-peated Single Malt aged 100% in ex-Burgundy Wine casks..
Springbank Distillery is one of the precious few holdouts in three, unique ways. The first is that they are still family owned — the Mitchell family has owned and operated Springbank officially since 1828. The second is that they are one of only two distilleries left in Campbelltown. The third is that they are one of only two distilleries in Scotland that controls all aspects of production on the same premises — from malting to bottling. Springbank produces a range of Whiskies across the favor spectrum, from sweeter “finished” drams through peated and spicy sippers in three brands, including Longrow, Hazelburn, and their namesake Springbank. Springbank 12 Year Burgundy Wood is one of those rare limited editions offerings that you’re glad you had and look for each time they are released. In a word, it’s “bold.” Like all Springbank Single Malts, this spirit is lightly peated, lending a mineral-smoke quality. Importantly, it’s aged a full twelve years in first-fill Burgundy Wine barrels and sparkled with fresh summer fruit notes. Uniquely, some Springbank Single Malt is distilled twice, and the rest is distilled three times. Thus, they often say that it has been distilled two and a half times. What does Springbank 12 Year Old Burgundy Wood taste like? The Flavor Spiral™ shows the most common flavors that you'll taste in Springbank 12 Year Old Burgundy Wood and gives you a chance to have a taste of it before actually tasting it. Dried fruit, warm minerals, maple, and pancetta. Beautiful, velvety mouth-feel with notes of salted shortbread, chocolate, strawberry, and oak. Medium length and dry with licorice and wood.